Guadalcanal (Seville), is a population of Iberian origin, located in a small valley watered by the Sotillo River, with remains of the Castle and medieval walls. The Hacienda La Florida is from the XVIII century (restored) of a solid construction with wide walls and vaulted ceilings which gives it a pleasant temperature throughout the year. - Casa Los Arcos. Capacity for 9 people. It has 2 rooms multiple, 1 room double, 1 bathroom, large kitchen-dining room and living room with fireplace. 1 room multipurpose, 2 room doubles, 1 bathroom, kitchen-dining room, living room with fireplace and large terrace. -Casa Molino. Capacity for 4 people. It has 1 double room, 1 room. double, 1 bathroom and kitchen-dining room with fireplace. Hacienda La Florida - It has abundant water running through its ditches and a large pool in beautiful landscaped spaces. - As well as a splendid porch and terrace with views of the mountains. 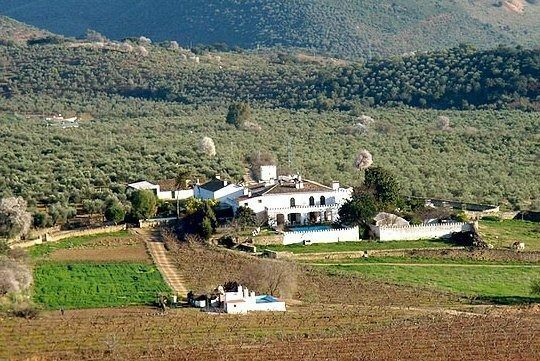 - The Cortijo la Florida with a total capacity for 20 people, consists of three complete and independent homes that can be rented together or separately according to the needs, which makes it ideal for large groups. - Casa Los Arcos. - Capacity for 9 people. - It has 2 multiple rooms. - Double room. - A bathroom. - Large kitchen-dining room. - Living room with fireplace. - House Mirador. - Capacity for 7 people. - It has 1 multiplex room. - 2 double rooms - 1 bathroom. - Kitchen-dining room - Living room with fireplace and large terrace. - Mill House - Capacity for 4 people. - It has 1 double room. - Double room. - A bathroom. - Kitchen-dining room with fireplace.